You have 24 hours to claim your prize. Congratulations. New NEUTROGENA® Wet Skin Sunblock Spray line is the first sunblock specially formulated to be applied to Wet Skin while offering broad spectrum SPF protection. The products of this comprehensive line for adults and kids. NEUTROGENA® commissioned a national survey that revealed more than 70% of Americans do not reapply sunscreen when they are outdoors for long periods of time. However, doctors and their professional organizations stress the importance of sunscreen reapplication to prevent sunburn. The Skin Cancer Foundation advises, "Reapplication of sunscreen is just as important as putting it on in the first place, so reapply the same amount every two hours." 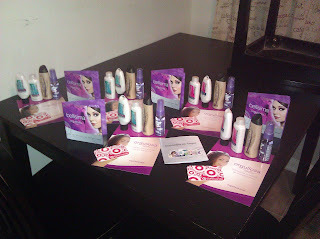 For more information about the brand, please visit: www.neutrogena.com. NEUTROGENA® Wet Skin Sunblock Spray es la primera línea de protección solar específicamente formulada para ser aplicada en la piel mojada mientras ofrece máxima protección solar. Los productos son para adultos y niños. A principios de año, NEUTROGENA® llevó a cabo una encuesta nacional que reveló que el 70% de los Americanos no se vuelven a aplicar el protector solar cuando están al aire libre por largos periodos de tiempo. Sin embargo, los doctores y sus organizaciones, reiteran la importancia de la re-aplicación del protector solar para prevenir la insolación. The Skin Cancer Foundation sugiere: " La re-aplicación del protector solar es igual de importante que la aplicación inicial, por lo cual se debe re-aplicar la misma cantidad cada dos horas". 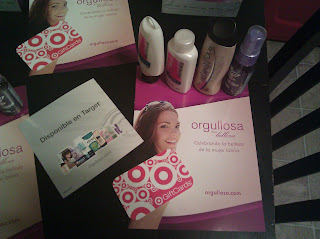 Para mas información sobre la marca, vista: www.neutrogena.com. My thoughts: I really like that this line of sunblock can be added while wet. How many times do you get to the pool and the kids jump in before you lather them up with layers of sunblock? I like that there is a product for the kids and for adults. Who wants to wait for the sunblock to dry? The kids really like it because it is a spray on, compared to the rub done. I also like that it is hypoallergenic. This giveaway ends on June 14 at 8 am. A winner will be picked at random.org. Please leave an email in your comment. The winner will have 24 hours to claim their prize. US only. Good Luck. 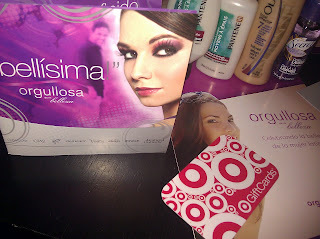 ***Disclosure-I received a Neutrogena Wet Skin gift pack for review. No monetary compensation was received. These are my honest opinions. You may have different results or opinions. NEUTROGENA® Oil-Free Acne Pink Grapefruit line, the products that eliminate acne and contain a refreshing Pink Grapefruit scent. 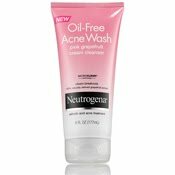 NEUTROGENA® Oil-Free Acne Pink Grapefruit line, los productos cual eliminan el acné y que contienen un refrescante aroma a toronja. My thoughts-The first thing that I like about this line is that it is Oil-Free because I have an oily face. 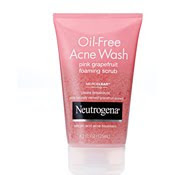 Oil-Free Acne Wash Pink Grapefruit Foaming Scrub has microbeads and it foams up really good. Oil-Free Acne Wash Pink Grapefruit Cream Cleanser is really refreshing with a cool sensation after you wash your face. 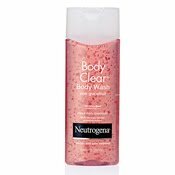 And Neutrogena not only takes care of the face but now it takes care of the body with Body Clear® Body Wash in Pink Grapefruit. I like the Grapefruit scent. 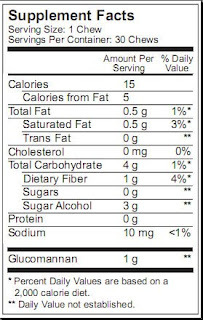 I knew Grapefruit was good for the inside but now it is also good for the outside. This giveaway ends on June 14 at 8 am. A winner will be pick at random.org. Please leave your email in your comment. The winner will have 24 hours to claim their prize. US only. Good Luck. 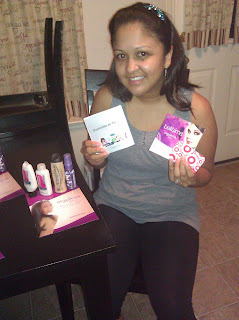 ***Disclosure-I received a gift pack to review. No monetary compensation was received. These are my honest opinions. You may have different results and opinions. It is always good to try a product for your own experience, and results. Are you ready and excited to go see X-MEN: FIRST CLASS? Want to go see it before all your friends? Do you live in Houston or surrounding areas? I have 15 general admission admit-2 passes to give away to the first 15 people to comment below. Please leave your email in the comment, that is the only way I am going to send you the instructions on how to get your pass. Screening Passes are not guaranteed entrances, they are first come, first serve basis. 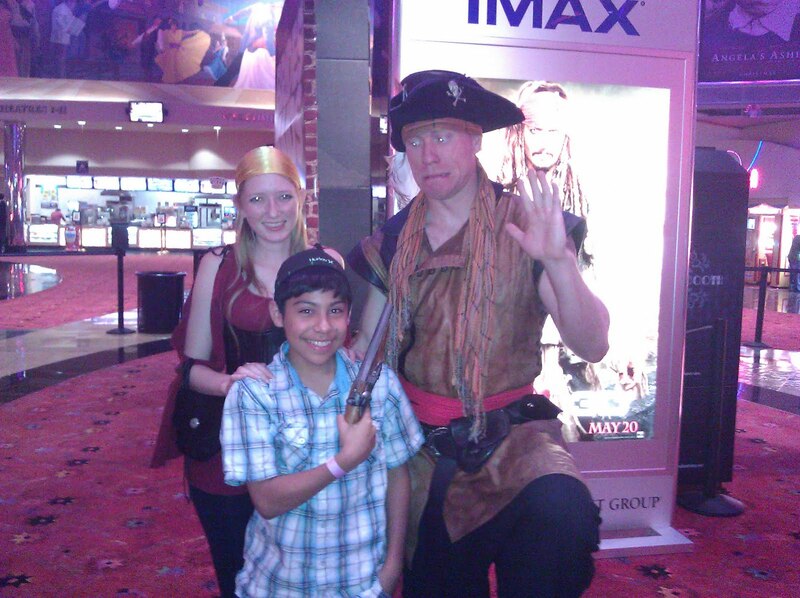 The screening is on Thursday, June 2nd at 9pm at Cinemark Memorial City. AMF's Summer Unplugged is this summer's best bowling deal! Time: open until 8:00PM, 7 days a week. Dates: Monday, May 30 (Memorial Day) through Monday, September 5 (Labor Day). Parents go to http://bit.ly/AMFfree to select a participating center (over 200 locations) and complete a simple registration form. Free game coupons emailed every Sunday starting May 29 for the following week – it’s that simple! Share the fun and save! Less than $7 per person for 2 games everyday all summer. Kids combo meals all summer for $2.99. Schedule of learn-to-bowl and fun competitive sessions. ***Disclosure-I participated in this campaign as a member of One2One Network and am eligible for a prize drawing. All opinions stated in the post are my own. Check out Facebook.com/DontFretTheSweat for money saving offers and expert tips, tools and real life stories about how parents are communicating and transitioning their tweens into confident and self-reliant teens. ***Disclosure-No monetray compensation was received. This post is my entry into a sweepstakes as part of my membership with One2One. I was very torn because I had to pick a winner. After reading all the different stories, there were a couple that really touched my heart. I contacted some to give me more information on the person or persons they would help as well. I would love to help everyone but I only have 1 giftcard to give away. So since I could not decide, I went to random.org, and we have a winner. Tiffany was diagnosed in August 2009 with a rare form of cancer called Ocular Melanoma. This is a very rare type of cancer of the eye. Doctors told her at the time that due to the size of the tumor the best course of action was enucleation, or removal of the eye. Tiffany handled all of this with amazing grace and strength. She had a prosthetic eye made and adapted amazingly quickly. Her insurance would not cover the cost of the eye, as it was deemed to be “cosmetic”, and she had to pay out-of-pocket for this. However, scans revealed no signs of cancer anywhere else in her body and she was deemed to be “cancer free”, and was told she just needed follow-up CAT scans every 6 months for the first 3 years. She had a beautiful baby boy Dylan in January 2011. During her pregnancy she was unable to have the CT scans completed. She had her most recent scan March 2011. It showed the cancer had returned to her liver and spleen. To make matters worse, she lost her health insurance the day after she learned of this diagnosis. Thankfully, Tiffany has been able to secure insurance from the “high risk pool” in Texas, and her coverage will be effective as of May 1st. However, the premiums and deductible are extremely high. In addition, treatment options are very limited. We are in the process of trying to research the best options quickly. It appears very likely that she will have to travel out-of-state to receive at least some of her treatments. There is a doctor in Pennsylvania that has some potentially promising treatments. 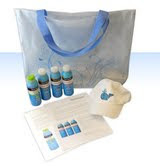 We are not sure at this time what all treatment is going to consist of, it is constantly evolving. If you would like to help Tiffany, please click here to go to her donation page. Bistec (beef) tacos get fiery heat with an adobo or marinade of garlic, cilantro, lime juice and three peppers – smoky ancho, sweet paprika and crushed red pepper. 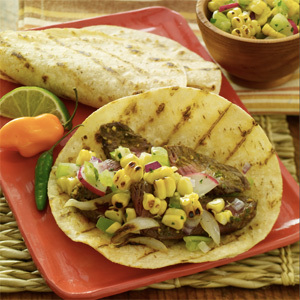 Serve the tacos with a refreshing salsa of roasted corn, tomatillos and cilantro. FOR THE SALSA, remove husks and silk strands from corn. Soak in water for 15 minutes. Grill corn over medium-high heat 10 minutes or until tender and lightly charred, turning occasionally. Cut kernels off cobs (about 2 cups). Mix corn, tomatillos, cilantro, green onion, radish, red onion, lime juice, oil, jalapeño peppers and salt in large bowl until well blended. Cover. Refrigerate at least 15 minutes to blend flavors. FOR THE STEAK, place garlic, cilantro, lime juice, water and seasonings in food processor. Cover. Process until smooth. Reserve 2 tablespoons. Place steak in glass dish. Add remaining adobo; turn to coat well. Cover. 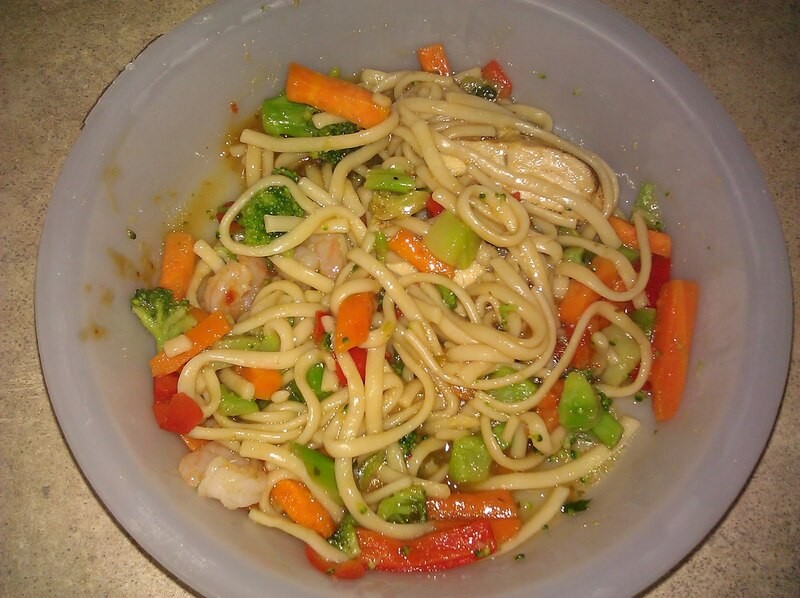 Refrigerate 15 minutes or longer for extra flavor. Remove steak from adobo. Discard any remaining adobo. GRILL steak over medium-high heat 3 to 4 minutes per side or until desired doneness, brushing with reserved 2 tablespoons adobo. Grill onions 2 to 3 minutes per side or until slightly charred. Grill tortillas 1 minute per side or until warmed. SLICE steak into thin slices. Slice onions into thin strips. Serve steak and onions in tortillas. Top with Salsa. Test Kitchen Tip: Boiler onions are small onions with a sweet, pungent flavor. They are often used whole in recipes for stews, kabobs and roasts. If unavailable, substitute cippolini or small sweet onions. PARA LA SALSA, retire las hojas y las barbas del maíz. Remójelo en agua durante 15 minutos. Sobre una parrilla, cocine el maíz a fuego medio alto durante 10 minutos o hasta que esté tierno y ligeramente tostado, volteándolo ocasionalmente. Desgrane el maíz (alrededor de 2 tazas). Mezcle bien el maíz, los tomatillos, el cilantro, la cebollita, el rábano, la cebolla roja, el jugo de limón, el aceite, los jalapeños y la sal en un recipiente grande y cúbralo. Refrigere durante por lo menos 15 minutos para que se mezclen los sabores. PARA EL BISTEC, mezcle el ajo, el cilantro, el jugo de limón, el agua y los sazonadores en un procesador de alimentos y cúbralos. Procéselos hasta que queden bien molidos. Reserve 2 cucharadas. Coloque el bistec en un plato de cristal. Agregue el resto del adobo, dele vuelta para cubrirlo bien y cúbralo. Refrigere durante 15 minutos o más para obtener más sabor. Retire el bistec del adobo. Deseche el resto del adobo. SOBRE UNA PARRILLA cocine el bistec a fuego medio alto durante 3 o 4 minutos por cada lado o hasta alcanzar el nivel deseado de cocción, barnizándolo con las 2 cucharadas de adobo. Cocine a la parrilla las cebollas durante 2 o 3 minutos por cada lado o hasta que queden ligeramente tostadas. Coloque en la parrilla las tortillas durante 1 minuto por cada lado o hasta que estén calientes. CORTE el bistec en rebanadas delgadas. Corte las cebollas en tiras delgadas. Sirva el bistec y las cebollas en tortillas. Vierta la salsa por encima. Los tacos de bistec adquieren un sabor bien picante con un adobo de ajo, cilantro, jugo de limón y tres chiles, el chile ancho ahumado, paprika o pimentón dulce estilo español y el chile rojo triturado. Sirva los tacos con una salsa refrescante de maíz asado, tomatillo y cilantro. 3) Go to McCormick.com/Espanol and check out the recipes, tell me which one other than the one in this post, that you would like to try. This giveaway ends on 05/31/11 at 8 am. One winner will be randomly selected. Please leave your email in your comment. I have the right to disqualify any comment. Thank you for entering and Good Luck. ***Disclosure-No monetary compensation was received. 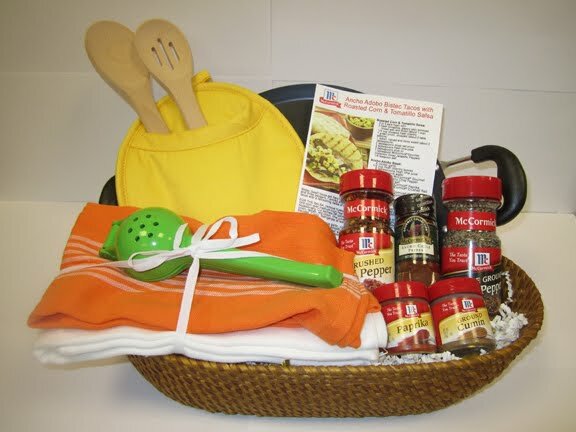 I will receive a McCormick Basket as this giveaway ends. As a Latina woman, many things make you feel proud: your traditions, your experiences, your language, your family. All the things that make you beautiful inside and out. That’s why Orgullosa de mi Belleza was created. It’s a program that celebrates the beauty and uniqueness of the Latina woman. Because feeling good about yourself is most important and is the start of feeling proud. Discover what Orgullosa de mi Belleza can offer you to help you enhance your beauty and feel more proud than ever. Thanks to Vocal Point for allowing me to throw a RSVP Party. I invited my girlies over for a girls nite of pampering. 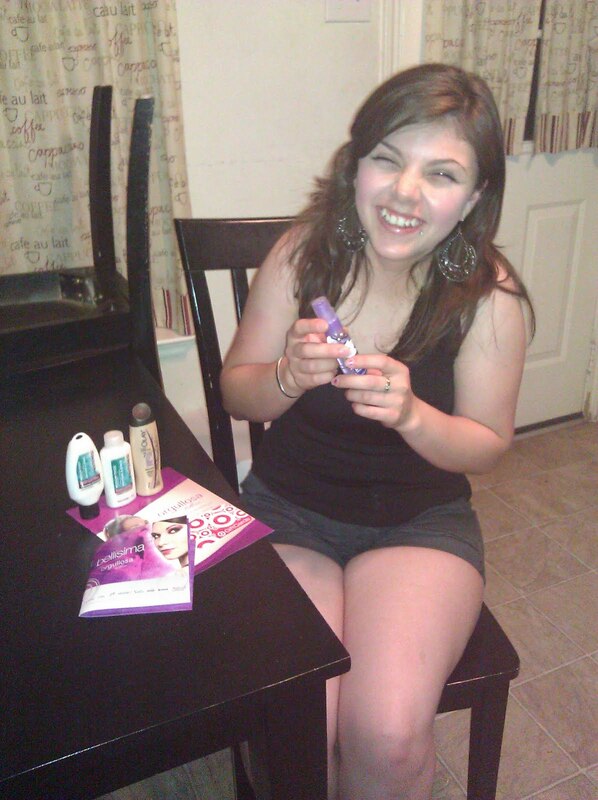 Check out the goodies they received Thanks to Vocal Point and Orgullosa.com. Orgullosa de mi Belleza es un programa que celebra la belleza de la mujer latina. Gracias a la colaboración de importantes marcas, Orgullosa de mi Belleza ofrece consejos personalizados, tips, novedades e información sobre productos. Un lugar en el que encontrarás todo lo que necesitas para realzar tu belleza. ***Disclosure-No compensation was received. I am a member of Vocal Point. I was selected to throw a RSVP party which came with a party kit which included sample product items, information pamplet, coupons, and a $5 giftcard for each guest. I, as the host, received a $10 giftcard. These are my honest opinions. Just recently here in Houston, voters voted to remove red light cameras. But the cameras may be saving lives, whether you are on the opposing team it could be your life that a camera may save one day. With the economy, and budget cuts, people are getting laid off and losing their jobs. It is happening everywhere including in the law enforcement fields. The red light cameras are extra man power we do not have. And the lives it saves, can be yours. My mom got hit by someone running a light a couple of years ago, so this is a topic I like to get information to pass along about. A recent study by the Insurance Institute for Highway Safety (IIHS) found that 113,000 people were injured and 676 were killed in crashes that involved red-light running in 2009 – two-thirds of the victims were pedestrians, bicyclists and occupants of vehicles hit by the red-light runners. The study also showed that red-light safety cameras helped save more than 150 lives in 14 of the biggest U.S. cities from 2004 to 2008. Had the cameras been operating in all 99 U.S. cities with populations more than 200,000, more than 800 lives could have been saved. Each time we enter an intersection, our families are at risk of becoming the victim of an accident – whether on foot or in a vehicle. Red light safety cameras help to change driver behavior and reduce the risk to our loved ones, however many people are unaware just how valuable these cameras are to those on the road. The National Coalition for Safer Roads has created a powerful video, showing just how tragic the consequences of running a red light can be. You can find the National Coalition for Safer Roads on their website, Twitter and Facebook pages, for more information about this important initiative. Join the Coalition in spreading this important message. You may save the life of a loved one or spare a family the heartbreak of losing a life to a tragic intersection accident. ***Disclosure-No monetary compensation was received. This is an informational post only. An adobo or marinade of garlic, citrus and warm spices like paprika and chili powder infuses pork chops with flavors from Mexico's Yucatan peninsula. Serve with a vibrant salad that’s packed with flavor and texture from grilled peppers, oranges, avocado and toasted almonds. FOR THE PORK, place all ingredients except pork in food processor. Cover. Process until smooth. Place pork in glass dish. Pour adobo over pork; turn to coat well. Cover. Refrigerate 30 minutes or longer for extra flavor. FOR THE GLAZE, mix all ingredients in small bowl. Set aside. Remove pork from marinade. Discard any remaining marinade. GRILL pork over medium heat 6 to 7 minutes per side or until desired doneness, brushing occasionally with glaze. Discard any remaining glaze. For the Salad, grill bell pepper over medium heat 3 to 4 minutes per side or until slightly charred. Cool slightly. Cut into strips. PLACE bell pepper in large bowl. Add frisée, oranges, avocado, red onion and almonds. Mix lime juice, oil, cinnamon sugar and salt in small bowl with wire whisk until well blended. Drizzle over salad; toss gently to coat. 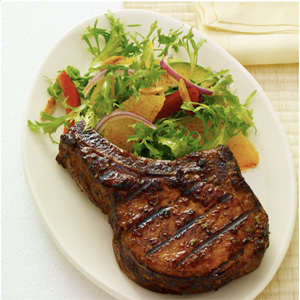 Serve pork chops with Salad. PARA EL CERDO, coloque todos los ingredientes excepto el cerdo en el procesador de alimentos y cúbralo. Procéselos hasta que queden bien molidos. Coloque el cerdo en un plato de vidrio. Vierta el adobo encima del cerdo, dele vuelta y cúbralo. Refrigere durante 30 minutos o más para obtener más sabor. PARA EL GLASEADO, mezcle todos los ingredientes en un recipiente pequeño y apártelo. Retire el cerdo del adobo. Deseche el resto del adobo. SOBRE UNA PARRILLA cocine el cerdo a fuego medio durante 6 o 7 minutos por lado o hasta que alcance el nivel deseado de cocción, barnizándolo ocasionalmente con el glaseado. Deseche el resto del glaseado. Para la ensalada, cocine el pimiento a fuego medio durante 3 o 4 minutos por cada lado o hasta que quede ligeramente tostado. Permita que se enfríe ligeramente. Córtelo en tiras. COLOQUE el pimiento en un recipiente grande. Agregue la endibia, las naranjas, el aguacate (palta), la cebolla roja y las almendras. Mezcle bien el jugo de limón, el aceite, el azúcar con canela y la sal en un recipiente pequeño con un batidor. Rocíe sobre la ensalada y revuelva suavemente para cubrir bien. Sirva las chuletas de cerdo con la ensalada. Un adobo de ajo, cítricos y especias picantes como el pimentón estilo español y el chile en polvo le da a las chuletas de cerdo los sabores de la península mexicana de Yucatán. Sírvalas con una exquisita ensalada repleta del sabor y la textura de pimientos asados, naranjas, aguacate (palta) y almendras tostadas. The @AsandoSabroso #McCormick Tour came to Houston last Friday & Saturday! The food truck tour started in San Antonio for Cinco de Mayo and will travel all the way to Los Angeles this summer. You can visit http://www.mccormick-espanol.com/Gira-Asando-Sabroso/Programa-de-la-gira-Asando-Sabroso.aspx for details on tour stops, dates, and times. Also follow @AsandoSabroso on Twitter. The tacos are only $1 and will go to the CIA Culinary Education Charity! Chef Johnny Hernandez, a rising star of Mexican cuisine, will be on the tour sharing tips for grilling. The food truck was also display at the Festival de Cindo de Mayo at the Reliant Center. Enjoy the tasty tacos for charity! Hora: 11 a.m. a 2 p.m.
Hora: 4 p.m. a 7 p.m.
***Disclosure-No compensation received. Informational post only. 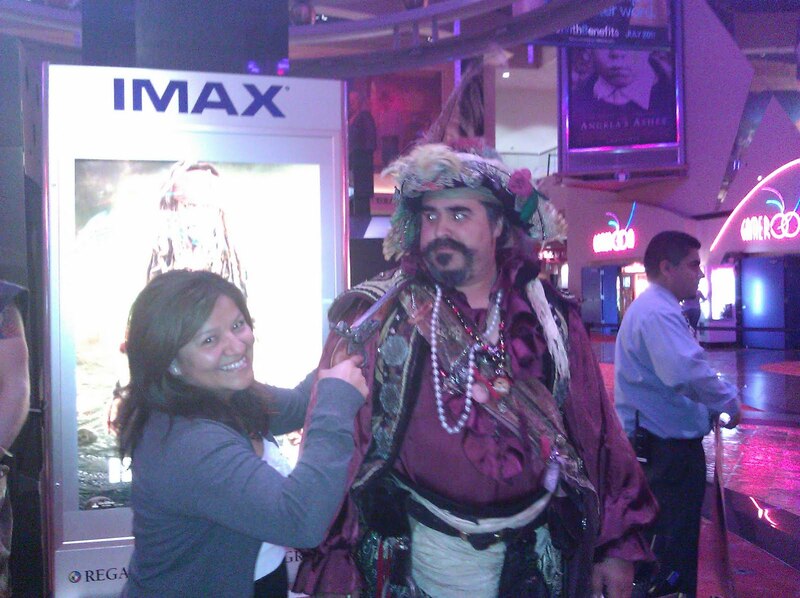 PIRATES OF THE CARIBBEAN: ON STRANGER TIDES (In Disney Digital 3D™) is a Comedic-Adventure. It is rated PG-13. And is hitting movie theaters tomorrow, May 20, 2011. If you have been a fan of this series, you have anxiously been awaiting this one after they left us hanging on the last movie. If you are not a fan, this is a great movie series to watch with the entire family. Trust me, I was not a fan. My husband was. I told you in a past post about me getting wrapped up in Part 2 and had to go back and watch the first one. I have been a fan ever since. Produced by Jerry Bruckheimer and directed by Rob Marshall, “Pirates of the Caribbean: On Stranger Tides” captures the fun, adventure and humor that ignited the hit franchise—this time in Disney Digital 3D™. Johnny Depp returns to his iconic role of Captain Jack Sparrow in an action-packed adventure. Crossing paths with the enigmatic Angelica (Penélope Cruz), he’s not sure if it’s love—or if she’s a ruthless con artist who’s using him to find the fabled Fountain of Youth. When she forces him aboard the “Queen Anne’s Revenge,” the ship of the legendary pirate Blackbeard (Ian McShane), Jack finds himself on an unexpected adventure in which he doesn’t know whom to fear more: Blackbeard or Angelica, with whom he shares a mysterious past. The international cast includes franchise vets Geoffrey Rush as the vengeful Captain Hector Barbossa and Kevin R. McNally as Captain Jack’s longtime comrade Joshamee Gibbs, plus Sam Claflin as a stalwart missionary and Astrid Bergès-Frisbey as a mysterious mermaid. Captain Jack Sparrow (Johnny Depp) finds himself on an unexpected journey to the fabled Fountain of Youth when a woman from his past (Penélope Cruz) forces him aboard the Queen Anne’s Revenge, the ship of the formidable pirate Blackbeard (Ian McShane). Disclosure-My family was invited to a special private screening. No compensation was received. These are our honest opinions. You may have a different opinion and just plain- (Arrrrr Mayte) may not like Pirates. This movie has been Independentmami viewed and Independentmami approved for all ages about 13. Visita la Página Facebook de JOHNSON'S Baby para la Oportunidad de Ganar! JOHNSON'S® ha lanzado la nueva campaña Treasuring Everyday Joy™, para invitar a los padres a reflexionar y prometer celebrar cada momento especial con sus niños. Comenzando hoy hasta final de año, con el fin de seguir animando a los padres a cumplir esta "promesa", JOHNSON'S® está llevando a cabo una serie de concursos de fotos en su página de Facebook. *Los participantes del concurso automáticamente califican para el Premio Mayor, el ganador será anunciado en Enero de 2012. La campaña de JOHNSON'S® hasta el día de hoy cuenta con la participación de 25,000 padres que se animaron a cumplir la "promesa" de Treasuring Everyday Joy™. 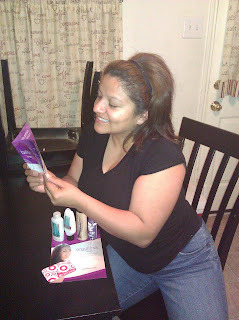 Por cada "like" que Facebook.com/johnsonsbaby reciba, JOHNSON'S® donará $1 a March of Dimes. Por favor ayúdenos a que otras familias disfruten de la experiencia de tener un hijo saludable en casa. Visit the JOHNSON'S Baby Facebook Page for your Chance to Win! This year, JOHNSON'S® is introducing the Treasuring Everyday Joy™ Campaign, which encourages parents to pause, reflect and promise to celebrate the everyday joy a baby brings to a parent's life - and to pay it forward. To continue encouraging parents to take the Treasuring Everyday Joy™ promise, JOHNSON'S® will host a series of photo contests on its Facebook page starting today and throughout the rest of the year. * Contest participants will be eligible for the Grand Prize, which will be announced in January 2012. Facebook.com/johnsonsbaby JOHNSON'S® will donate $1 to March of Dimes. Please help us in taking the "promise," so that all families can experience the joy of a healthy baby. LOS ANGELES (May 4, 2011) __ Twentieth Century Fox Television and Twentieth Century Fox Film have partnered with GLEE creator Ryan Murphy to produce GLEE LIVE! 3D!, a film of the blockbuster “Glee Live! In Concert!” North American tour. Twentieth Century Fox will release the film – for a special limited two-week engagement -- in theaters everywhere on August 12, 2011. GLEE LIVE! 3D! will enable fans – or, “Gleeks” -- who were unable to obtain tickets to the sold-out shows, or who live in markets not included in the tour, or who just want to see it again, to experience the concert in the immersive magic of a 3D theatrical event. Starring 14 members of the Emmy and Golden Globe Award-winning television show’s cast and shot live during the summer concerts, the movie will capture the unique concert experience along with special moments involving the characters themselves. Kevin Tancharoen (“Fame,” “Mortal Kombat: Legacy” series) will direct the film. Tickets for “Glee Live! In Concert!” went on sale in February and are nearly sold out in all scheduled venues, prompting the studio to add additional shows for which limited tickets are still available. The concert series begins May 21 in Las Vegas with “Glee” stars Lea Michele (Rachel), Cory Monteith (Finn), Amber Riley (Mercedes), Chris Colfer (Kurt), Kevin McHale (Artie), Jenna Ushkowitz (Tina), Mark Salling (Puck), Dianna Agron (Quinn), Naya Rivera (Santana), Heather Morris (Brittany), Harry Shum, Jr. (Mike), Chord Overstreet (Sam), Darren Criss (Blaine), Ashley Fink (Lauren) and members of “The Warblers” performing an all-new singing and dancing celebration of the Emmy and Golden Globe Award-winning show. The concert tour wraps up June 18 in Uniondale, New York, before moving on to the United Kingdom. For more information, please visit “Glee” at www.gleetour.com. Now in its sophomore season, GLEE – which airs Tuesdays at 8/7c on FOX -- is a biting musical comedy about a group of eager and ambitious students who strive to outshine their singing competition to win Nationals while navigating the cruel halls of McKinley High that has quickly become a pop-culture phenomenon. This season’s No. 1 scripted hour among Adults 18-49, Adults 18-34 and Teens boasts critical acclaim, a loyal fan base of “GLEEks,” two Platinum and two Gold albums, more than 29 million song downloads, the record for the most titles on the Billboard Hot 100 by a non-solo act (beating out Elvis Presley, James Brown and The Beatles), an incredible 19 Emmy nominations – earning it the distinction of being the most-nominated series of the year – and four Emmy Awards. To top it off, the genre-defying, award-winning series has been picked up through its third season. GLEE is produced by Ryan Murphy Television in association with 20th Century Fox Television. Ryan Murphy, Brad Falchuk and Ian Brennan are co-creators of the series. Murphy, Falchuk, Brennan and Dante Di Loreto serve as executive producers. Become a fan of GLEE on Facebook at facebook.com/glee and follow the series on Twitter at twitter.com/gleeonfox. Twentieth Century Fox Television is a leading supplier of entertainment content domestically and around the world. Twentieth Century Fox Television comprises its flagship studio, as well as Fox 21 and Fox Television Studios. CINCINNATI, OH, May 5, 2011 /PRNewswire/ — Pantene has announced a new advertising campaign, featuring two of the most well-known women in Hollywood. Actresses Eva Mendes and Naomi Watts have been named new celebrity ambassadors for Pantene. Beginning in July 2011, both women will appear in all elements of the brand’s holistic marketing campaign, including TV and print advertising, in-store displays, iMedia and public relations campaigns. Mendes will be supporting the Breakage to Strength collection and Watts will be supporting the Flat to Volume collection. May 11, 2010 — HUNT VALLEY, MD — Today, Sofia Vergara joins a new modern family: she just signed her first beauty contract with COVERGIRL and announced it herself on Twitter and Facebook live from the set. The Emmy® nominated actress and mother is currently shooting her first advertising campaign for the cosmetics giant. The ads are scheduled to debut in January 2012 and Vergara will be representing some innovative new additions to the COVERGIRL product line-up. “I have loved playing with makeup ever since I was a little girl," said Sofia Vergara. “And now, I am so honored to join the line up of extraordinary women that are and have been COVERGIRLs, and to be a part of a brand that is so committed to helping women look and feel beautiful." SOfia is such a cute Latina with such a great attitude. I love watching her on Modern Family and her other projects. She is representing. 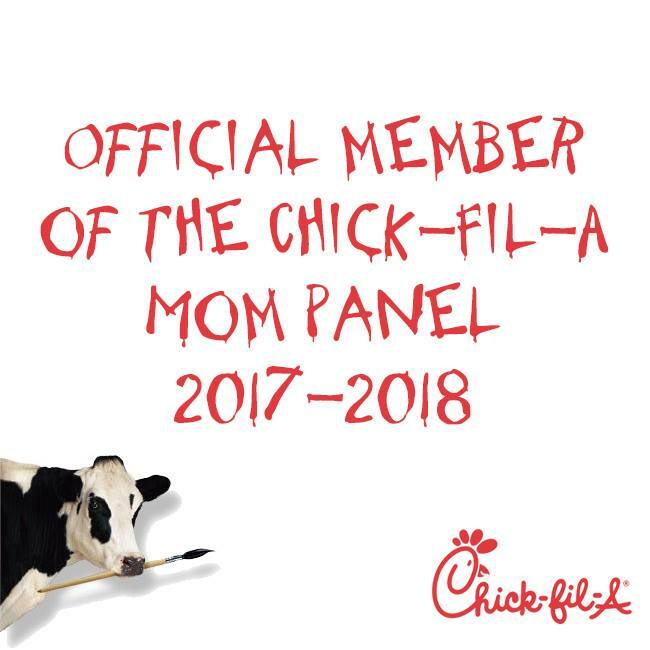 So excited about this announcement. I am sending out emails. You have 24 hours to claim your prize. Thank you for participating. Stay tuned for some Neutrogena Giveaways coming really soon!!! Terra Launches new Site: "Remodela tu Casa"
Terra has teamed up with Home Depot to launch a new home improvement special, Remodela tu Casa. Our new expert, Fabiana Rodriguez, will answer any question you may have in mind, like how to remodel a small room and still keep it creative or how to complete or create a project. 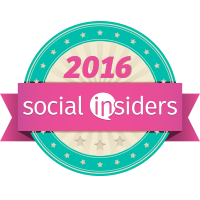 This new innovative site will help you get great project ideas, save money, and be entertained! "Remodela tu Casa" provides users with videos, photos, how-to guides, tips, examples of home improvements and products to get at Home Depot to help you with your project. Users will have the opportunity to submit 'before and after' photos of home improvement projects for a chance to win a pre-paid Home Depot card. Terra brings you all of this in time to help you tackle your home improvement project! 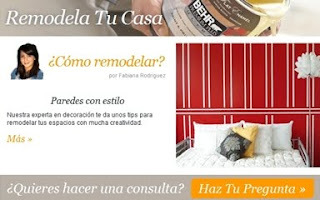 Visit http://www.terra.com/vidayestilo/remodela-tu-casa and get all your answers from our home improvement expert Fabiana Rodriguez. Renovate, Decorate, Celebrate! Terra Lanza una Nueva Página: "Remodela tu Casa"
Terra se asocia con Home Depot para lanzar un nuevo especial de remodelaciones del hogar llamado Remodela tu Casa. Nuestra nueva experta, Fabiana Rodríguez, contestará cualquier pregunta que tengas en mente y te dará tips tales como remodelar un espacio pequeño y a la misma vez con mucha creatividad o como completar o empezar un proyecto. ¡Esta nueva página te ayudará a obtener nuevas ideas para tus futuros proyectos, ahorrar dinero y a la misma vez mantenerte entretenida! En "Remodela tu Casa" los usuarios tienen la oportunidad de ver videos, fotos, guías, tips, ejemplos de remodelaciones del hogar y productos para comprar en Home Depot para que te ayuden y simplifiquen tu proyecto. Usuarios tendrán la oportunidad de enviar sus fotos de 'antes y después' del proyecto de la remodelación de su hogar para un chance de ganar una tarjeta pre pagada de Home Depot. ¡Terra te trae todo esto justo a tiempo para ayudarte con tu proyecto de remodelación! ¡Visita http://www.terra.com/vidayestilo/remodela-tu-casa y obtén todas tus respuestas de nuestra nueva experta de remodelación Fabiana Rodríguez. Renueva, Decora, Celebra! First I have to apologize for BLOGGER not working. I could not log on, as well you could not comment. I lost draft of blog posts I had already created and had scheduled. In the mist of all of this, I was holding a big secret in which I wrote a really long post about but lost after all the BLOGGER mishaps. So, maybe that was a sign that it was TMI...or too long. So short but sweet, I am pregnant. I am very excited. My son is 12 years old, so I don't remember anything. It is like a have never had a baby. I will be sharing my news, stories, and happenings here. So stay tuned. Today was my first visit to confirm the pregnancy. I have another appointment next week so I will post then with an update. Muve Music is available at Cricket company-owned stores and at www.mycricket.com as well as through select partner retail outlets. For a complete list of Houston locations, click here . The Muve Music unlimited wireless rate plan is $55 per month. The Samsung Suede has an M.S.R.P. of $129 through May 23. Additional accessories are available for purchase including premium headphones, an audio jack and Bluetooth adapter to connect to home and car stereos, either wired or wirelessly. For more information about Muve Music, visit www.muvemusic.com , and for Cricket’s dynamic device lineup, visit www.mycricket.com . HOUSTON – April 26, 2011 – Cricket Communications Inc., a leading provider of innovative and value-driven wireless services is excited to provide Muve Music to the Houston market. Muve Music is now available in 48 Cricket markets across the country. Muve Music is a $55 a month unlimited wireless rate plan that includes unlimited voice, text, Web, video and unlimited music downloads to the mobile phone. Consumers do not need a credit card or a computer. With Muve Music, consumers can view, select and enjoy digital music right on their mobile phones and through Bluetooth-enabled products such as a home or car stereo. The Muve Music library, which continues to expand, features artists from the 55 record labels of the four major music companies Universal Music Group, Warner Music Group, Sony Music Entertainment and EMI Music as well as music from more than 50 countries through independent aggregator IODA. Houstonians are now able to enjoy music from thousands of musicians, as well as local favorites like Chamillionaire, Lil Flip, Beyonce, and Robert Earl Keen. Cricket is the pioneer of simple and affordable unlimited wireless services with no long-term commitments or credit checks required serving more than 5.5 million customers in 35 states and the District of Columbia. Cricket offers wireless voice and broadband Internet services over the latest technology, high-quality, all-digital 3G CDMA2000 1X and 1xEV-DO wireless network. Cricket’s nationwide wireless voice service plans include unlimited anytime minutes, unlimited U.S. long distance, unlimited text and picture messaging, unlimited text to Mexico, unlimited Mobile Web, unlimited directory assistance, as well as a variety of calling features and feature-rich mobile applications such as popular games, ringtones and wallpapers. For more information on Cricket, visit www.mycricket.com . Cricket is offered by Leap Wireless International, Inc., headquartered in San Diego, Calif. For more information on Leap, visit www.leapwireless.com . Éste Día de la Madre, Papá y los niños pueden demostrarle a mamá cuánto la quieren con recetas fáciles de preparar con el ingrediente más importante: Amor. Mamá disfrutará despertarse con unos deliciosos Huevos Benedictinos. El ingrediente MAGGI® Caldo Sabor a Pollo le da a éste platillo de desayuno un sabor único que no podrá resistir. Para un postre especial, prueba los Bocaditos Deliciosos de Jugo hechos con NESTLÉ® JUICY JUICE® 100% de jugo natural. Los niños disfrutarán preparar éste divertido postre del mismo modo que mamá disfrutará comerlo. Para obtener otra receta fácil de preparar que los niños y papá pueden preparar juntos este Día de la Madre, mira el video de demostración de Ani (en español) sobre cómo preparar Deliciosas Tortitas de Elote. Los niños pueden ayudar a mezclar los ingredientes mientras papá los cocina. COMBINA la media crema, la mostaza, el jugo de limón y el caldo en una olla pequeña. Calienta a fuego bajo de 1 a 2 minutos o hasta que se caliente (no dejes que hierva). Agrega el eneldo y reserva aparte. CUBRE una sartén antiadherente grande con el espray y caliéntala a fuego medio. Rompe los huevos en la sartén teniendo cuidado de no quebrar las yemas. Reduce el fuego a bajo y cuando las claras de los huevos estén cuajadas en las orillas, agrega el agua y tapa la sartén. Cuécelos hasta que estén hechos a tu preferencia. COLOCA una rebanada de jamón sobre cada pan tostado y luego con un huevo y termínalas rociadas con la salsa de media crema. Decora con eneldo fresco. ESPOLVOREA la gelatina sobre 1 taza de Juicy Juice en un tazón grande. CALIENTA las 3 tazas restantes de Juicy Juice en el microondas a alta potencia (100%) durante 3 minutos o hasta que esté muy caliente. Vierte con cuidado sobre la mezcla de gelatina y bate hasta que se disuelva. Vierte en una bandeja para hornear de 13 x 9 pulgadas de tamaño o un molde para brazo de gitano lo suficiente grande para acomodar la mezcla. AGREGA las frutas a la bandeja y tápala con film de plástico. Refrigérala durante por lo menos 2 horas para que cuaje. Usando los moldes de galletas, corta la gelatina en formas. Pampers is working hard to make this world a better place for every little miracle. Little Miracle Missions is a program that encourages people to help one another in fun, unexpected ways. From time to time we'll suggest a way for you to support a little miracle. Gather some friends to join the cause and Pampers will complete their own larger mission reaching families across the country. Think of it as a chain of good started by you. Once you finish your mission, share your story and photos of how you inspired us all. Every time you do some good you can enter The Little Miracles sweepstakes for a chance to win free diapers and wipes for a year*. *Limit one entry per person per day. Everyone can easily participate in a small way by logging on to Pampers Facebook page (Facebook.com/Pampers) by hitting ‘like’ and then going to the Miracle Missions tab and committing to Missions. As a side note, anyone who pledges is automatically entered to win a year’s supply worth of Pampers diapers and wipes (and that can definitely help someone in a big way!). Independentmami received a $50 gift card to Pay-It-Forward. I did not even think twice of who I would help. My family and I are always helping others with money, food, or services. But I had one family in particular that we really wanted to help. My son sings in the church youth choir. He loves to sing. THe youth choir always him to express himself, grow as an individual, and also learn how a team works together. I am so thankful for these individuals who take time every week to practice with our kids for 2 hours a week with no pay. They are even taking the kids to a trip to New York this summer. The are exposing them to culture, and new places. One of his youth leaders got into a serious accident and has been disabled for a couple of months. The entire church is helping them out while he recovers. Well his wife is pregnant and is ready to pop. 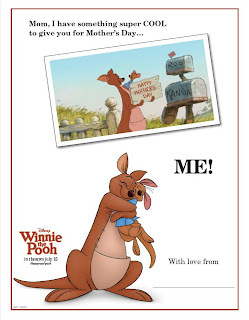 I know as an expecting parent, (You heard right, I'm pregnant!! ), one of the first thing you think about is all the pampers you have to purchase. 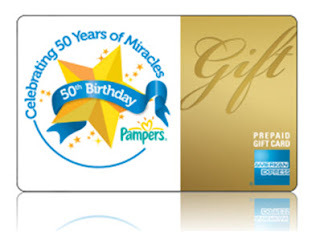 So we decided to use the entire $50 giftcard on pampers, so Tom will have one less worry when the baby comes. The kids and parents are putting together a baby shower for them as well. How would you Pay-It-Forward in your community? 1) Tell me in details -How will you use this $50 gc to Pay-It-Forward? Who will you help? Where would you help out? I will pick 1 winner with the best Pay-It-Forward idea. Please leave your email. This giveaway ends Monday, May 23 @ 8 am. The winner will have 24 hours to claim their prize. Good Luck. ***Disclosure-I received a $50 gc to use as a Pay-It-Forward. No monetary compensation was received. These are my honest opinions. In Mexico and Central America Mother's Day is always celebrated on May 10. Mother's Day is the largest card-sending occasion for Hispanics beating out both Christmas and Valentine's Day! En MExico y Centro America El Dia de las Madres siempre es celebrado el 10 de Mayo. EL Dia de las Madres es el dia que se mandan mas tarjetas por hispanos ganadole a la Navidad y el Dia de San Valentin. WINNIE THE POOH returning to theatres this summer (July 15th). As you know I have been eating healthy and trying to control and watch everything I eat. 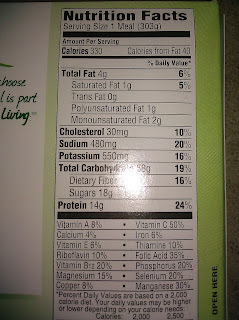 It is an everyday job of counting calories and trying to get all the nutrition I need from the food I eat. 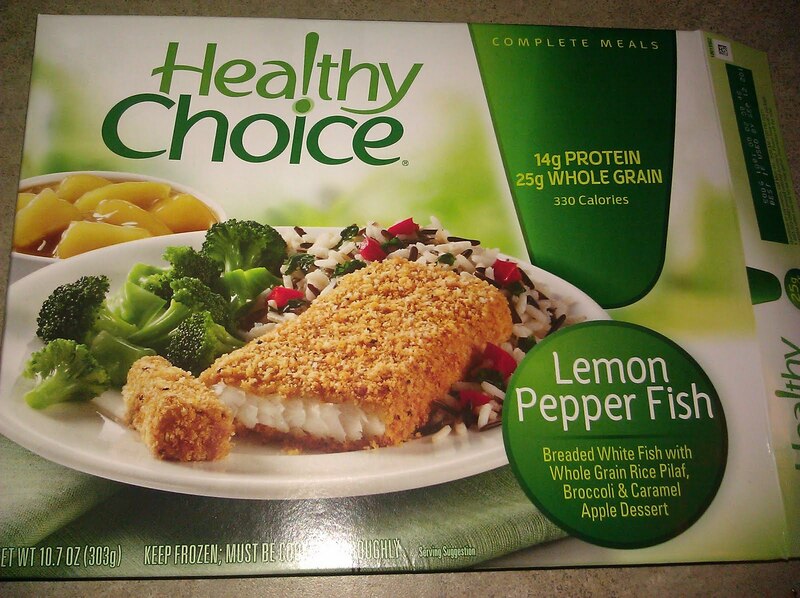 I had the opportunity to review 2 Healthy Choice meals. When I headed to the store the first thing I noticed was the packaging. 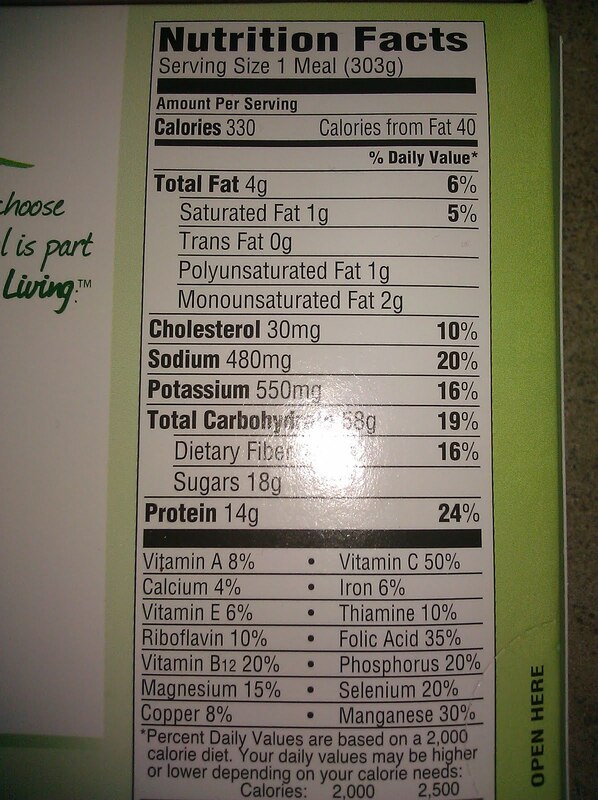 Check this picture out, how easy is it to see how much protein, whole grain, and calories there are in this meal? Very easy. So looking for a healthy meal was simple. Picking out a meal now thats the hard part, they all looked very good. But here is what I picked. Independentmami thoughts-The Lemon Pepper was really good. I even got a dessert. This meal was only 330 calories. After a long day at the office I put this in the microwave for under 5 minutes and it was ready to go. And I did not have to worry about nutrition because it had it all, fiber, whole grain, etc.. Great meal!! Independentmami thoughts-The Lemongrass Chicken and Shrimp hit the spot. 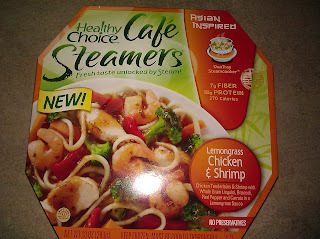 I love Asian food. Now I do not have to worry about not eating healthy because this meal only has 270 calories. The great taste with all the nutrition. And this meal was so easy to make right in the microwave. According to the Center for Disease Control (CDC), two-thirds of American adults are overweight or obese, which puts them at increased risk for heart disease, diabetes and the metabolic syndrome. Recent research shows that replacing 10 meals per week with a portion-controlled Healthy Choice meal, as part of a reduced calorie diet, can lead to improved quality of life and dietary quality. The study, conducted during 2009 and 2010, followed more than 60 participants for 30 days with one group primarily eating Healthy Choice meals for lunch and the other group mainly for dinner every day. Participants were also instructed to add 2-3 food items to their diet, such as fruits and vegetables, according to their caloric/gender needs. The research was presented by the Rippe Lifestyle Institute at the Experimental Biology Conference in April 2011 and funded by ConAgra Foods. As Americans look for ways to make simple, positive changes to their diets, incorporating a ready-to-eat, pre-portioned healthy option, such as Healthy Choice, is a simple way to be more health conscious, lose weight and improve quality of life. Healthy Choice has nearly 70 varieties for fewer than 400 calories that provide positive nutrients such as whole grains, fiber, protein and antioxidants. For more information visit www.healthychoice.com. ***Disclosure-I received 2 coupons for product review. This is a sponsored post and compensation is being received. These are my honest opinions. These meals have been Indepedentmami tasted and are Independentmami approved. I am going to introduce you to Slimmies, a Chocolate Chew. About the Program – The Slimmies Weight Loss Program is designed to effectively reduce fat absorption, boost metabolism and control appetite, essentially promoting overall health and wellness. 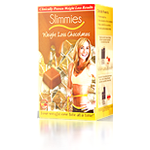 Slimmies is a Weight Loss Chocolate Chew that helps you feel full faster, so you eat less, and with its active ingredient Luralean, helps reduce the fats and calories absorbed from the food you do eat. Luralean is a soluble fiber (100% plant-based natural formula) with a high molecular weight and viscosity compared to other fibers, and thus provides support for weight management, regularity, glycemic control, and lipid metabolism. Used in hospitals for patients, child obesity treatments, and for elderly diabetes patients, Luralean is designed to act naturally and physically in your body, not chemically, making it one of the safest weight control methods currently available. Voted ECRM as the best new diet product in North America, Slimmies is truly an amazing product, and has some fantastic package deals being offered to those interested in starting this weight loss program – Buy 2 Get 1 Free, and the Fit for Life Program. More details about Slimmies current offers and science background, as well as an informative video, and clinical studies can be found on their Official Website – https://myslimmies.com. 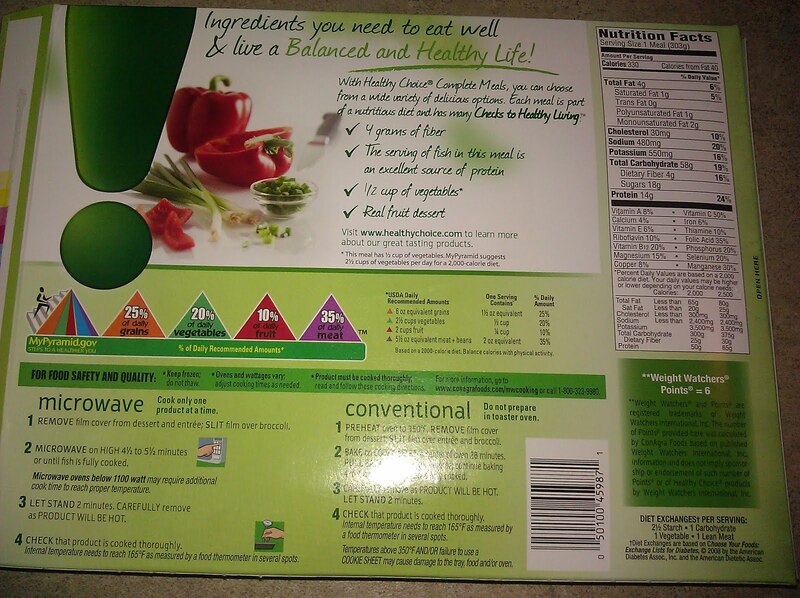 Disclosure-I received sample product for this review. No compensation was received. These are my honest opinions. 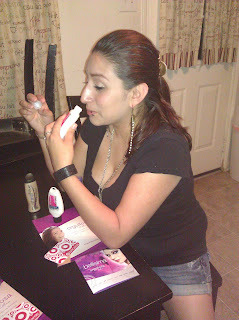 This product has been Independentmami tested and Independentmami approved. You should always try a product out yourself and make your own conclusion. My family and I were able to screen the new CURIOUS GEORGE® episode, “Mother’s Day Surprise!,”. We threw a screening party for our family and friends. The kids had a blast watching CURIOUS GEORGE® while eating some popcorn. The parents, as well as myself, loved that the Mother's Day episode celebrates hispanic heritage. I love PBS and that they take learning to another level. Incorporating hispanic heritage teaches our kids about diversity that we live in especially when they add characters like Marco. All the kids gave the episodes a thumbs up. They watch it over and over at the screening party. Mother's Day episode celebrating Hispanic Heritage and Latina moms. George helps Marco surprise his Mami with a party. Together, they make a pinata and other festive decorations. George, Betsy and Steve try to guess the number of super-mega fun balls in a rocket-shaped dispenser at Dulson's Toy Store in order to win the balls and dispenser. Then George keeps a weather journal. George, the Man With the Yellow Hat, Hundley and the Doorman go on a sailboat trip, but a cracked boom forces them to stop on a remote island to make repairs. Then, while leading Steve and Betsy on a tour of the forest, George follows a rainbow. Disclosure-I received all items for the screening party with an exclusive press preview dvd, popcorn, and other items. No compensation was received. These are our honest opinions. The inspiration for the look was exotic and dramatic, it was over the top, perfect for her performance of ET, says makeup artist Jake Bailey. On Katy’s skin I created her signature perfect and polished, flawless canvas. Then, to create the unique, almost-alien look, I used Plasta Wax from Makeup For Ever, to cover a section of the eyebrows and then altered the shape of her brows to extend them up to her temples. This is a fun, theatrical product which is great for videos and performances. To create the dramatic pink cheek, I used NARS Eyeshadow duo in Caravaggio, using the darker shade to define the contour of her cheek and the lighter shade along the ridge of her cheekbone to add dimension. I then lightly applied COVERGIRL Clean Pressed Powder on the T-zone, which is a great way to set the foundation and remove shine without obstructing the glow from liquid foundation. To create Katy’s eye, I first defined and extended the shape of her eye using COVERGIRL LiquilineBlast in Black Fire. For the color I used the NARS Caravaggio and NARS Eyeshadow Duo in Rated R using elements of fuscia and neon green/yellow to add lots of color and fun to the look. To finish the eye, I applied exotic feathered lashes from Shu Uemura on the top and a few coats of COVERGIRL LashBlast Fusion on the bottom lashes. We finished the look with a dramatic purple lip using COVERGIRL LipPerfection lipcolor in Embrace. Este look tuvo una inspiración exótica y dramática, lo máximo, perfecto para su presentación de ET. Prepare el cutis de Katy para convertirlo en ese lienzo nítido, impecable y perfecto que lo caracteriza. Entonces, para crear ese look singular casi de extraterrestre, utilicé Plasta Wax de Makeup For Ever, para cubrir una sección de las cejas y después alteré la forma de éstas para extenderlas hasta sus sienes. Este es un producto teatral y divertido que resulta fantástico para maquillar cuando se hacen videos o este tipo de presentaciones. Para crear esas mejillas rosadas tan dramáticas, utilicé las sombras Eyeshadow Duo de NARS en color Caravaggio, empleando la tonalidad más oscura para definir el contorno de las mejillas y la tonalidad más clara siguiendo a todo lo largo del hueso de su mejilla para añadir dimensión. Acto seguido, apliqué ligeramente Clean Pressed Powder de COVERGIRL en la zona T, lo cual es una magnífica manera de fijar la base y remover el brillo sin obstruir el resplandor de la base líquida. Para crear los ojos de Katy, primero definí y extendí la forma de sus ojos usando el delineador LiquilineBlast de COVERGIRL en color Black Fire. Para el color usé las sombras Caravaggio de NARS y las Eyeshadow Duo de NARS en color Rated R, usando elementos de fucsia y verde neón/amarillo para agregar mucho color y variedad en el look. Para finalizar los ojos, apliqué exóticas pestañas de plumas de Shu Uemura en la parte superior y algunas capas de la mascara LashBlast Fusion de COVERGIRL en las pestañas de abajo. Finalicé el look con dramático color labial púrpura usando el creyón labial LipPerfection de COVERGIRL en color Embrace. Have you had it your way, lately? Have you tried the new Chicken Tenders at Burger King? My family and some friends were invited to a private party where we were able to try out the Chicken Tenders. The Chicken Tenders come in 4, 8, and 20 pieces. They have sauces to dip it in like Zesty, Buffalo, BBQ, Honey Mustard, Ranch, or Sweet & Sour sauce. Would you like to taste the New Crispy Chicken Tenders? Here is how to enter to win 1 of 5 $10 giftcards? This giveaway ends May 16. 5 winners will be randomly selected and each receive a $10 Burger King gift card. Please leave your email in the comment. Good Luck. US only. ***Disclosure-My family and I attended a private party where we were provided food, gc, toys for the kiddos, and we even got see the movie HOP. No monetary compensation was received. These are my honest opinions. These tenders have been Independentmami tested and Independentmami approved.